Hundreds of mourners gathered in Portadown this morning to say their final farewell to Norman Prentice, who had been missing for more than two weeks. 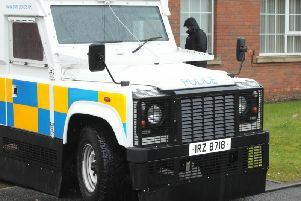 Searches across the Co Armagh town took place since January 15 when he was first reported missing. However his family were told on Saturday about the discovery of the 55-year-old’s body in the River Corcrain. It has been a gruelling two weeks as the community united to search for the popular father-of-four. At Requiem Mass in the Church of St John the Baptist, Fr Peter Clark spoke of how much Norman was loved and how good a father he was to his children, John, Peter, Maria and Conlon. The priest told the congregation, of old and young, how Norman, from Corcrain Gardens, was a sociable man much loved by his family and friends. “We have to acknowledge that, being sociable, he was well loved in the community who rallied round to search for his remains. Fr Clark extended his sympathy to Mr Prentice’s family - his father John, his sisters Eileen and Marion, his children and his extended family. His family, particularly his elderly father John, were visibily upset as Mr Prentice’s body was brought out of St John the Baptist Church. Mr Prentice was interred in St. John’s Cemetery, Lylo.